Karyn Almendarez is a writer, blogger, and a retired elementary teacher. She lives in Colorado with her husband, Albert. When she is not teaching or writing, she enjoys visiting her daughter, son-in-law, and four grandchildren in Texas. She also enjoys snow skiing and hiking. “Clouds of grief would engulf me at the weirdest times. One minute I would be tending to everyday activities, and the next minute a paralyzing heaviness would press down on my body and spirit.” — from Tragedy’s Treasures, A Mom’s Journey Through Grief. A heartfelt window into the shock and devastation of losing a sixteen-year-old son in a car wreck, Tragedy’s Treasures shares the hope of twelve faith-based treasures the author experienced before, during, and after the tragic death of her son. She describes how these treasures revealed themselves through circumstances, prayers, choices, and divine intervention. Through genuine and personal experiences, this book delivers encouragement that life can go on and that it is okay to feel any emotion at any given time throughout the grieving process. Karyn Almendarez is not a minister or counselor. She is a teacher, wife, and grandmother who encourages to have hope and faith in God’s master plan. Twenty years plus after her son’s death, Karyn Almendarez’s story provides a reflective look at the events in her life that point to God’s master plan. Her childhood, education, career choice, family, friends, and faith have inspired her to share her personal journey of grief and hope. 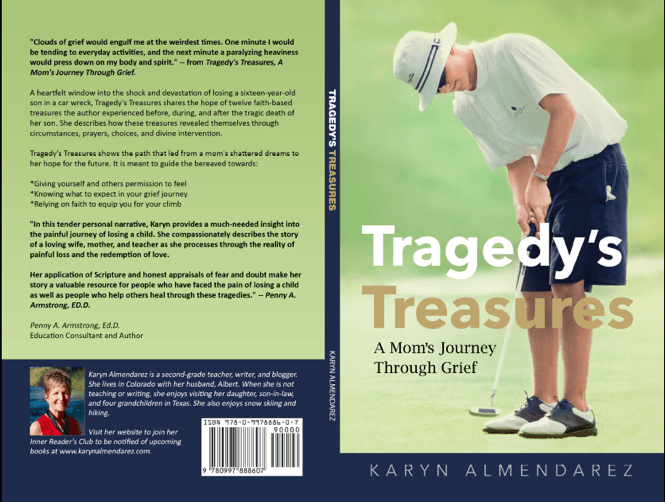 Karyn Almendarez is blogger and author of Tragedy’s Treasures, A Mom’s Journey Through Grief. Karyn Almendarez is a blogger and writer. She is the author of Tragedy’s Treasures, a Mom’s Journey Through Grief, her personal account of twelve faith-based treasures she discovered before, during, and after the death of her sixteen-year-old son in an early morning car accident. Visit her website www.karynalmendarez.com. Karyn Almendarez is a blogger, writer, and retired second-grade teacher. She is the author of, Tragedy’s Treasures, A Mom’s Journey Through Grief. She shares her account of twelve faith-based treasures she discovered before, during, and after the death of her sixteen-year-old son in an early morning car accident. She lives in Montrose, Colorado, with her husband, Albert, and their cat, Minnie. She and her husband enjoy antiquing, snow skiing, and relaxing in the majestic mountain scenery. Karyn’s daughter, son-in-law, and four grandchildren live in Texas. You may read her encouraging blog posts and sign up for her free newsletter at www.karynalmendarez.com. 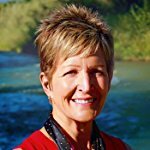 Karyn Almendarez is a writer, author, and a retired second-grade teacher who enjoys living in the mountains of Colorado. Her passion drives her to encourage and uplift others through her writing. Her non-fiction book, Tragedy’s Treasures, a Mom’s Journey Through Grief, shares twelve faith-based treasures she discovered before, during, and after the death of her sixteen-year-old son in an early morning car accident. Her interest in writing and editing began in high school as she co-edited her high school newspaper. Then, her senior English teacher inspired her to learn to write more than just news copy. Before she and her husband moved to Colorado, she knew she wanted to write a book, and her students in Texas had encouraged her to write a book about her son. While on a horseback riding trip in Snowmass, Colorado, the inspiration for Tragedy’s Treasures leaped into her brain and heart. By the time the two-hour horseback ride was complete, she knew the title, outline, and the number of chapters. The messy, hand-written notes she hurriedly wrote when she returned, morphed into her first book. She now lives in Montrose, Colorado with her husband, Albert, and their cat, Minnie. She and her husband enjoy antiquing, snow skiing, and relaxing in the majestic mountain scenery around them. Karyn’s daughter, son-in-law, and four grandchildren live in Texas. You may read her encouraging blog posts and sign up for her free newsletter at www.karynalmendarez.com. 2. Karyn Almendarez has always loved to write. She has written many unpublished poems. After her son died, many poems he had written surfaced.